Now that I have made all 4 of the canvas pictures, I need to hang them up. You can check out the previous post on how to make these [Canvas Photos]. I am so excited with the way all 4 of them turned out. 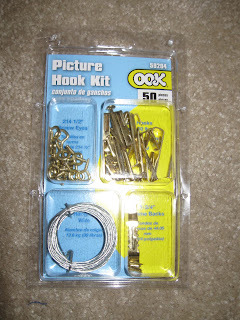 Since the canvas doesn't come with hooks on it to hang, I had to buy a picture hanging kit. This kit was great because it had everything. The eye screws, wire and the wall hooks. First, I screwed the eye screws into the backs. Then I twisted the wire on from side to side. It was so easy to do. Just remember to make each one the exact same size, therefore allowing them to all hang at the same height. And here is the finished product on the wall. I really love the way they turned out! Aren't they the cutest kids. There is still more to add to the wall so I will show you as it come along. They are such cute kids! Amazing job!